Rumors suggest that Microsoft will reveal its next generation consoles at the upcoming E3 event in June. Since 2017, the company has fully redefined its gaming strategy and gained a number of competitive advantages thanks to the release of Xbox Play Anywhere and Xbox Game Pass. Going forward, I believe that new consoles along with the cloud gaming service xCloud will be Microsoft’s major catalysts of growth in the gaming industry. As the whole gaming industry is patiently waiting for the announcement of the next generation of consoles, Microsoft (MSFT) seems to be eager to improve its stance in the gaming business, considering that it failed to successfully compete with Sony (SNE) for its place under the sun in the past and as a result lost the 8th generation console battle. Since the beginning of the year, there were countless rumors about Microsoft’s upcoming next generation project Xbox Scarlett that might be announced in the next few months. In addition, in October, the company unveiled its game streaming service xCloud that plans to give gamers the ability to play their favorite titles on any device that has a stable connection to the internet. In Q2, Microsoft’s gaming business entered its prime, as its revenues were $4.2 billion, which accounts for around 13% of the company’s overall revenues during that period. While in the past gaming played a little role in the company’s business model, it now seems that Microsoft has finally found an edge in the industry and is fully prepared to tackle the gaming market, which has been on the rise for the last decade and has a compounded annual growth rate of 11%. As gaming starts to play a bigger role inside the company, we should expect it to have a greater effect on Microsoft’s stock, considering that Windows revenues are slowly declining. When Xbox One was released in 2013, Microsoft decided to target the product as an entertainment hardware that has multiple features besides gaming. The problem was that while Microsoft executives were constantly promoting console’s TV-related apps, there were no exclusive games for the console. Because of it, players didn’t have an incentive to buy Xbox One and as a result, the strategy backfired. The table below shows the total number of consoles that were sold by the end of February from major hardware manufacturers. 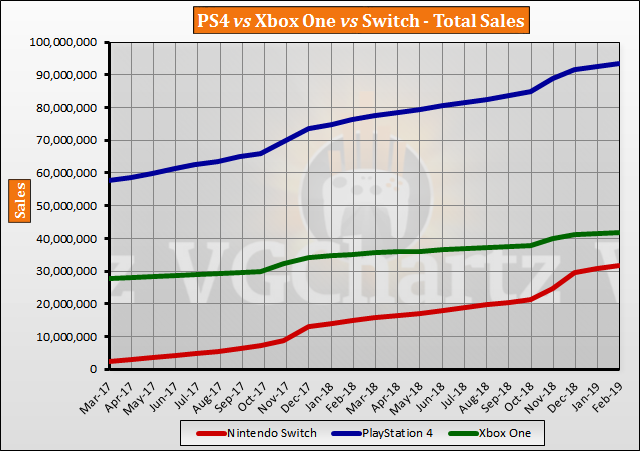 As you see, Sony with its PlayStation 4 undoubtedly holds a lead over Microsoft’s Xbox One by a wide margin, while the sales of Nintendo’s (NTDOY) recent console Switch slowly but surely grew in volumes and will soon overtake its American counterpart. Bring high-quality games to every device possible on the planet. 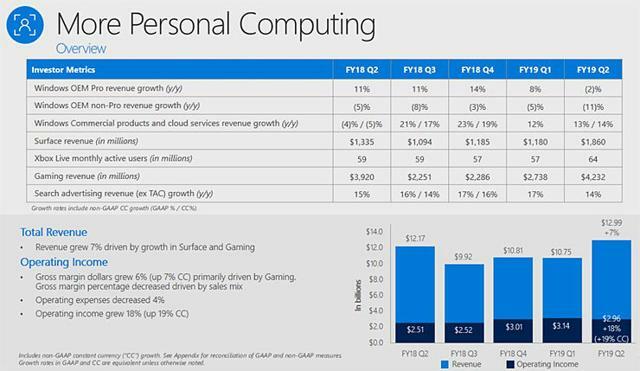 In the recent 10-Q filing, Microsoft reported that overall gaming revenues were up 8% in Q2, while the company’s Xbox Live service reached 64 million users. As the gaming revenues grew and the number of Xbox users is also on the rise, gaming itself starts to play a greater role in Microsoft’s business model. The release of Xbox Play Anywhere program in 2016 began the shift of the company’s gaming strategy. The program itself gives gamers the ability to play a number of Microsoft first-party titles either on Xbox One or Windows 10 without the need to buy those titles the second time. By giving such an option, Microsoft aims to connect players to the Windows ecosystem and be able to offer them other products from its portfolio. At the moment, Microsoft’s plan to dominate gaming consists of hardware and software strategies. The hardware strategy is centered around the company’s ability to manufacture its own consoles and attract developers to create their content for those consoles. While Xbox One had a weak launch, in late 2017, Microsoft released an upgraded version of the original console called Xbox One X, which at the moment is the most powerful 8th generation console that has 4K support. However, it’s no secret that modern PCs are much powerful than the newest consoles. That’s why going forward, Microsoft plans to release a couple of new Xbox consoles that in addition to Xbox services are aimed at giving the best gaming experience at an affordable price. At the beginning of this year, a number of outlets started to say that Microsoft is fully preparing the release of its next project that holds the name Scarlett. Xbox Scarlett is a project that includes two consoles that are named Lockhart and Anaconda. We are yet to see the announcement of those consoles, but I’m sure that Microsoft will not disappoint us like it did back in 2013. When it comes to software strategy, Microsoft has been eager to pick up its game and make sure that it will not repeat the mistakes of the past. During E3 2018, the company announced the purchase of 5 new development studios that are already working on new titles. In November, the company announced that it purchased two additional studios bringing the number of its first-party developers to 13. The acquisition spree that happened last year signals that Microsoft is prepared to face the competition and offer enough games to satisfy different demographic groups. Members increase their total time gaming on Xbox by almost 20% more than before... In addition, the average back-catalog game sees its usage increase by 6X after joining the Xbox Game Pass library. However, the biggest announcement came out last October, when Microsoft unveiled its own cloud gaming service xCloud. The service aims to provide users with the ability to play their favorite titles on any device without the need to download them in the first place. At the moment, xCloud is in beta stage and it’s unlikely that we will see its full release this year. Besides Microsoft, it was reported that Amazon (AMZN) and Tencent (TCEHY) are also working on their own versions of cloud gaming service, while Google (GOOG) (GOOGL) a few weeks ago already revealed its own streaming platform called Stadia, which is expected to be released by the end of this year. While innovations are undoubtedly good for consumers, I’m more than certain that all of those companies will face the same issues that Sony faces with its own cloud gaming service PlayStation Now. Latency issues, constant lags and disconnect from the server remain to be the top challenges for the Japanese company, even though the service was released a few years ago. That’s why I believe that the company that will be able to fix all of those issues first will have an upper hand in the business and be able to establish a stronger presence in the industry, which will subsequently lead to the creation of shareholder value. Microsoft’s newest gaming strategy, in my opinion, is a justified gamble with a big payoff, if executed correctly. It’s impossible to stop Google or Amazon from entering the space and breaking the console monopoly, as their technological capabilities will soon give the ability to run triple-A titles through the cloud. That’s why developing xCloud is a no-brainer, in my opinion, if Microsoft wants to continue to be a big player in the gaming business. At the same time, the implementation of xCloud on a global scale gives an option of accessing billions of mobile players to whom Microsoft didn’t have access before, as it did not publish any mobile title in the recent years, while the business was growing at 26.8% annually. In addition, the number of active video gamers increases with each year and is expected to be 2.7 billion people by the end of 2021, which is more than the population of Europe, North and South America combined. If xCloud becomes successful, Microsoft will be able to expand its reach into the new territories and access new demographic groups, which will lead to the creation of additional shareholder value. At the same time, I believe that it will take a couple of years before the technology could be used on a global scale. That’s why releasing new hardware in the next year makes sense, considering that Xbox One specs are fairly outdated in 2019. At the moment, it’s hard to say how many new consoles Microsoft will be able to sell, considering that there was no announcement yet and we don’t even know anything about the titles from the first-party developers that I’m more than certain will be launching along the release of Lockhart and Anaconda. With the gaming revenues on the rise and as the number of Xbox users increasing, it seems that Microsoft has finally figured a way on how to profit from its own gaming products and services. 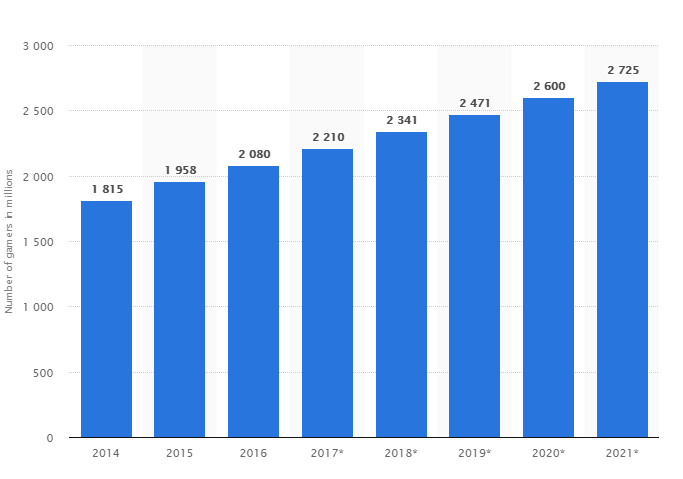 In the long run, gaming will play a larger role in the company’s business model, as in Q2 it accounted for ~13% of the overall revenues during that period, while the number of gamers will continue to increase globally.